Honda Big Red After Market Full Cab Enclosure w/Lexan Windshield-Retail Value-$1,199.99-ON SALE NOW for $899.99! 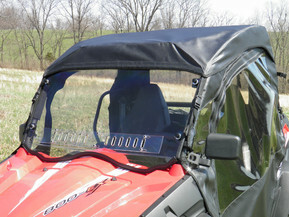 The GCL UTV After Market Full Cab Enclosure with Lexan Windshield is a great combo. The combo is hand crafted with the finest materials for a superior product. The cab is manufactured with professional grade marine fabric with stay-true long lasting color, stabilized fit and is water repellent, tear resistant, puncture resistant, mildew and UV resistant. The door windows and rear window are made of durable Aqua-View Smoked vinyl allowing for an uninhibited view and total clarity. The cab doors roll back for those warmer days. The Full Cab Enclosure with Lexan Windshield comes with installation instructions and adhesive Velcro for easy installation and perfect fit.